I had an interesting flight from Seoul to LA on a Korean Air Airbus 380. We had our two dogs so we used our miles to upgrade to prestige class, which might be the same as business but I’m not sure because there was a sign for first / business class in addition to the signs for prestige and economy. Anyway, in prestige class they had a little lounge where a flight attendant would mix a few different types of cocktails (not many choices but still kind of neat). In the lounge, we met three Buddhist monks (drinking coffee, not cocktails). We got to chatting and we got a lesson on zen mediation. I tried out the practical aspects like posture and breathing. My wife listened to theory and translated. You’ll have to excuse me for not passing on all the secrets – i don’t feel qualified to teach zen just yet. We’ve been persuaded to try to meditate a bit before bed each night and we each have a couple of Buddhist bracelets to remind us to do our meditating. Plus it’s just a neat travel story. So we’re not quite done packing and tonight I have a going away party, but with or without all the stuff we intended to bring, we are getting on a flight to LA tomorrow. I don’t remember if I have wifi in my LA hotel or not but I’ll try to post a blog entry or two from there before I move on to Florida. Here’s an interesting article about retiring in Bali, Indonesia. Apparently it’s cheap and happy. See also movie tourism in Bali. My apologies for not posting with any sort of regularity recently. I’m busier now than I have been in a long time. Part of that is getting ready to move – bringing dogs to the vet, packing things, selling things, giving things away, trying to figure out what life will be like in America, and so on. If anyone knows a nice dog-friendly hotel in LA please do leave a comment. Other than that my travel plans are mostly set in terms of planes and things. Turns out that’s the easy part. And the other thing that’s been keeping me busy is being put in charge of the hiring process for a professor to replace me (and another professor to replace a colleague who is being forced to leave because she is 65). I mention this because I talked about teaching EFL as one of the jobs that requires travel and so maybe suitable for readers of this site with an itch to see the world. Interestingly, there are a ton of people with MA degrees and even a few with PhDs looking to teach English in Korea. Some have relevant degrees like TESOL (Teaching English to Speakers of Other Languages) and Applied Linguistics. Some are in the ballpark like English literature and MFAs. We also got several applicants with MBAs – all from the University of Phoenix – does this anecdotal evidence say something about the job prospects of their graduates? It’s funny though – seeing the fierce competition for my job makes me wonder if I should really be leaving it for the unknown future waiting for me in the US. When I was 23 and leaving America to spend a year in Korea (who knew it would become 11?) I don’t remember being this nervous. I was giving up a job in a car dealership that paid $8 an hour as opposed to a real nice job like the one I have now. And I didn’t have a wife. And I didn’t have many belongings I needed to bring (I left some stuff in America since it was only for a year). I did have a cat but I left him with my parents – this time I’m bringing 2 dogs with me (our oldest little boy died a few weeks ago and we’re really sad that he won’t get to experience America). I had a job waiting for me in Korea 11 years ago. And I was younger and more adventurous. All in all it’s a totally different feeling moving back to America than it was leaving for what I thought would be a year back when I was 23. Mystery at Gettysburg: General Farnsworth monument? I am one of those people who could not get enough of the national park at Gettysburg. I drove the 3 hours to the park about 125 times between 1998 and 2001. It bothered me that I could not find a monument to General Farnsworth who was killed on the 3rd day of the battle in a cavalry engagement. There are monster monuments to Generals who basically were held in reserve at the battle, how could there be no monument to a General who died in action? In 2000 I grew frustrated in my search and went to the people in the park office and they pulled out a list of all the park monuments and after checking told me there was no monument to Farnsworth. I was not happy my search had ended this way, but what could I do . A couple weeks later I was reading Sickles biography and Dan Sickles talked about a trip he made to the park around 1888 and he talked about how Farnsworth died and he described a monument to Farnsworth at the park made of cannonballs. It seemed strange that a cavalry generals monument would be made of cannonballs but there was no mistake Sickles was talking about Farnsworth. I returned to the park office with book in hand and the people at the park were dumbfounded to say the least. They insisted if the monument was there in 1888 it was still there today. Sickles description of the location of the monument was not to detailed but I searched in the area as best I could and could not find it. In the summer of 2001 I made several more searches and failed to find the monument, I decided to return in February 2001 and search when the leaves and brush that hide many monuments is gone for the winter. I found a detailed description in Batles and Leaders of where Farnsworth died and decided to search there. Unfortunately I got very sick that winter from Epilepsy and my driving days are over. I am unable to return to the park to finish my search so I am now reaching out on this website to ask if there are any Civil War buffs out there who might know the answer or would like to take a look while at the park. 1. Bring chocolate and a sleeping bag. The chocolate is for energy because you’ll be getting tired. The sleeping bag is for the lodges you’ll be staying in – pretty spartan apparently. 2. Be wary when paying for transportation. No fixed price on taxis and buses means drivers will be overcharging you as often as they can. 3. Pay your porters more than your luggage is worth. Otherwise they may just run away with your stuff. Aruba for honeymoon in September? About to pull the trigger on Aruba after much research. We wnat a September honeymoon there. I went once when I was a kid, 16 years ago, so I imagine a lot has changed (not that I remember much anyway). I am looking into the Riu there as a nice all-inclusive package but I am open to hear other feedback on other Hotels. I would do the Hyatt, but I don’t believe they offer all-inclusive which is what we want. The best all-inclusive in Aruba is the Westin, but its almost 50% more than the Riu, which I’ve heard is the next best AI resort. People are all very friendly and speak English. It’s out of the hurricane zone, gets a lot of sun but has steady trade winds so you can stay on the beach all day and not get too overly hot. Also remember Aruba is much closer to the equator than other islands. The sun is VERY STRONG. Sun screen is an absolute must anytime you are outdoors. I got sun burned on the jeep tour even with sun screen and I normally don’t even from being at the beach all day. Also, a lot of people don’t realize how arid Aruba is. It is like a desert in certain places. Everything is relatively close (airport, resorts, casinos, etc.) and the climate usually means you don’t have to worry about your trip being ruined by rain. Also, I wouldn’t do an all-inclusive. There’s quite a few solid restaurants I’d prefer to hit while there. 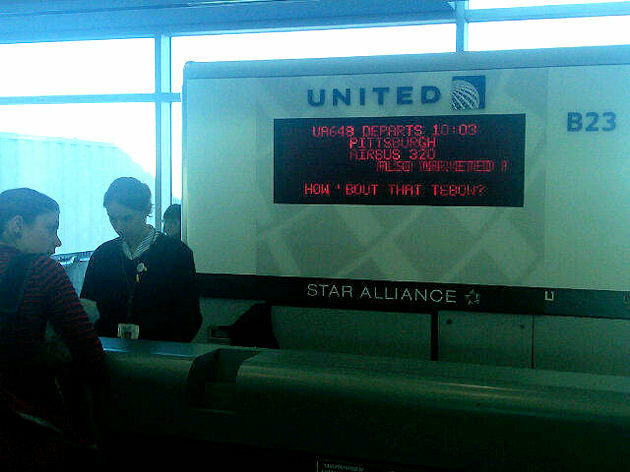 A United Airlines ticket counter in Denver makes fun of Steelers fans after Denver Broncos beat the Pittsburgh Steelers in a playoff game. For any non-football fans, Tim Tebow is the somewhat controversial Denver Broncos quarterback. Many people love him but he certainly has enough detractors saying he has no talent. But the did help the Broncos beat the Steelers.